The Set-up: Place three discs on each side to form a sideline. Divide the team into two and have them stand directly across from one another at the central disc (as pictured). The Exercise: The red player quickly sprints around the yellow disc and tries to race into the far shooting zone without getting tagged. Blue immediately reacts to red’s movement (not the urgings of the coach), by sprinting around the red disc and tagging the red player before he can cross into the shooting zone. Focus: Quick Reaction, Speed & Agility, Fun! Who Can Score the Fastest! The Set up: Same as the initial exercise, but now coaches have balls. The Game: When the Coach shouts Go! Both players (first player in each line) quickly sprints around the red/yellow disc and call for the ball. The Coach now passes the player from his/her line a ball. 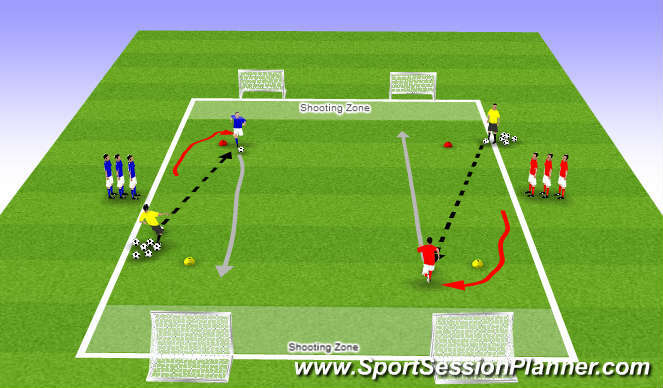 The players must quickly gather control of the ball, dribble with speed into the shooting zone and score in either of the two goals. Who Can score the Fastest! The Game: When the Coach shouts Go! Both players (first player in each line) quickly sprints around the orange/yellow disc and call for the ball. The Coach now passes the player from his/her line a ball. The players must quickly gather control of the ball, dribble with speed into the shooting zone and score in either of the two goals. Who Can score the Fastest! The Reward: If the Red player scored quicker than the blue player the coach immediately passes a ball to the red player (as pictured). The red player now attacks the two goals on the opposite end of the field while blue transitions to defend the red player. This will create a 1v1 to 2 goals. The play is “live” until the ball goes out of bounds or a goal is scored. Coaches should enforce the boundaries to keep the exercise moving!